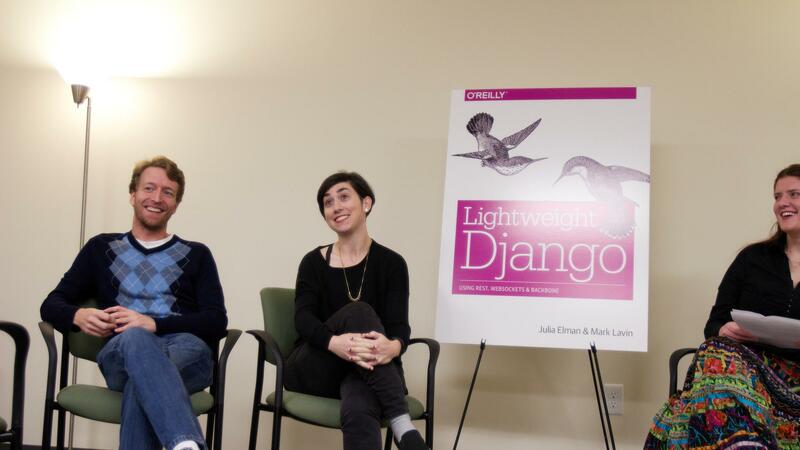 With Girl Develop It RDU, we celebrated the launch of Lightweight Django (O'Reilly) with the authors, Caktus Technical Director Mark Lavin and Caktus alum Julia Elman. Sylvia Richardson of Girl Develop It MCed. The event was open to the public and so popular we kept recounting the RSVPs and fretting over the fire code. But, phew, we were good. In attendance were friends, family, fellow Cakti, and Django fans from around the Triangle. Congratulations again to Mark and Julia for their great achievement. Also, many thanks to Sylvia for her smooth MC'ing skills, Girl Develop It RDU for co-hosting, O'Reilly Media for the books, and everyone who braved the traffic to get here.